If you ask Moussia and Yosef what their favorite game is they would probably say "Shabbos table." Really! They love to cover their small play table with a white tablecloth and set it with their play candlesticks, challah and kiddush cup. 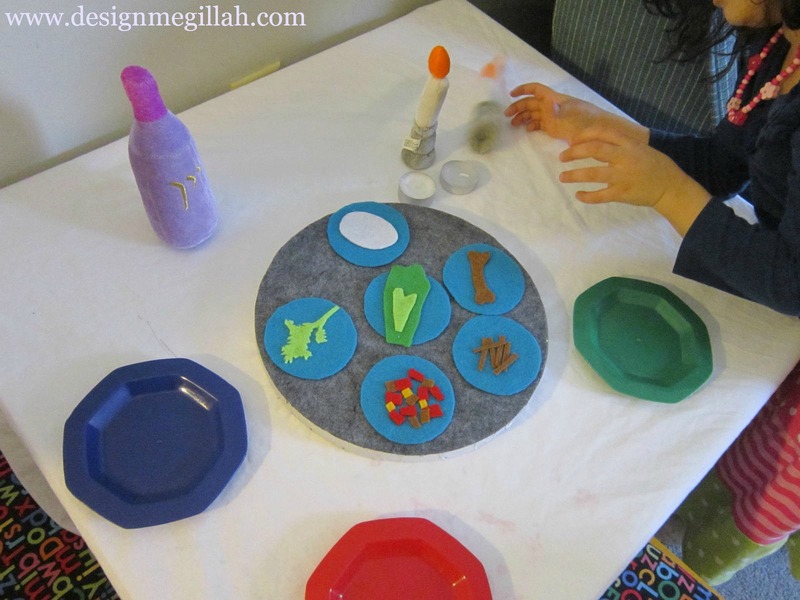 Since Passover is around the corner, I thought it might be fun for them to add "Seder table" to their playtime. 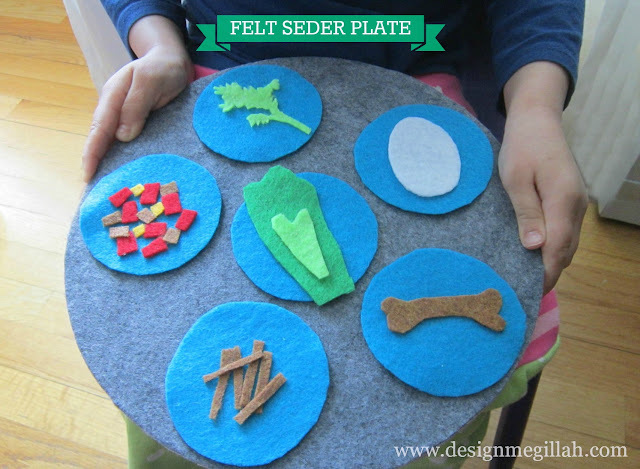 I made them this felt Seder plate to get started. It's really nothing more than colored felt and a cake base from Michael's. Clockwise from top left: I picked up a pack of these 10-inch cardboard cake bases--they are half an inch thick so the kids can't bend them. After tracing and cutting the gray felt I glued that onto the base. 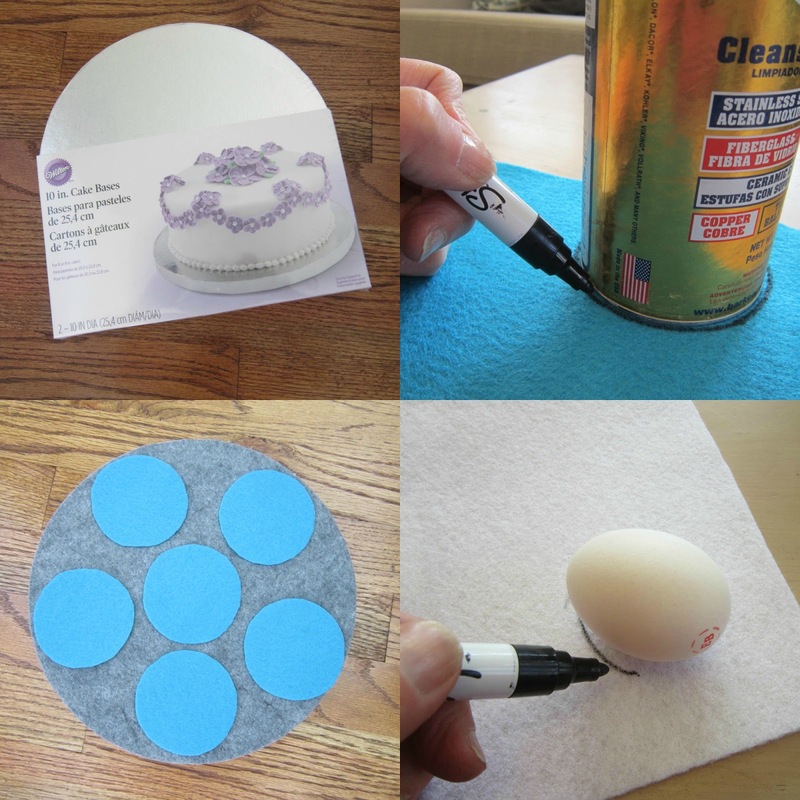 Next, I did the same using blue felt making smaller circles for the little plates. Although I traced the egg on white felt, I drew the other Seder plate ingredients free-hand. Each one was glued onto the blue little plates. It kept them busy most of the afternoon! adorable! a feature of course, and wishing you a chag kasher v'sameach! I'm really trying hard to free myself of the slavery of accumulation, but it's so very difficult! I love it! Of course they're going to have hours of great playtime with it. It's so adorable! And including blue, red and green plates are fantastic, too. Thank you Karen--the kids are enjoying playing "Seder table"!